Just the two of you? We have you covered! What could be more romantic than a loving couple stealing away for an intimate wedding? Exchange your vows in the cozy comfort of the Chapel or in our beautiful and private "Promises Garden." Weekends, weekdays, short notice... Bishop Deb can usually accommodate your desire for an Elopement ceremony, working within your timeframe. Sweetheart Chapel is available to you for 30 minutes. This allows time for your arrival, the wedding and photographs. The Elopement ceremony is intentionally small - just for you and two witnesses. It is meaningful, non-religious (unless you prefer it) and just fifteen-minutes in length, perfect for the couple who wants something simple. 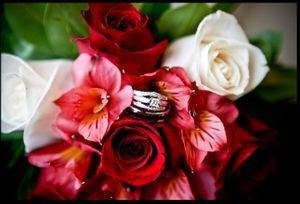 You have a choice of contemporary or traditional vows or you are welcome to offer your own vows. Deborah, or one of the witnesses, can take pictures with your camera to capture the happy event. You may bring along two witnesses. If it is only the two of you, we can arrange witnesses for an additional fee of $25 per witness. When we receive your booking and payment, we send along the ceremony via email. There you'll find several vow options. Simply let us know which ones you prefer when we finalize the ceremony details. You'll need an Ontario wedding license. For information on where to obtain one, please refer to the FAQ page. Please arrive five or ten minutes before your appointed time. There is a space in the driveway for your vehicle, so you do not have to worry about parking, which can be challenging in the summertime. Please note that this is our home, and while there is a washroom available for your use, we do not have a change room. We expect that couples will arrive wedding-ready. Upon the receipt of your electronic transfer or paypal payment your requested date and time will be confirmed via email. Payments are non-refundable. The balance may be paid by phone or Paypal before the ceremony or in cash the day of the wedding.